I was such a big fan of Pitch Black that I put it on my top ten of 2000. While I didn’t think The Chronicles of Riddick would surpass Pitch Black, I hoped it would be an exciting, worthy sequel. But so much is wrong with Riddick that it’s easier to spot the few things that are commendable: its original style, the prison planet segment, and maybe the ironic twist at the end. Mostly, Riddick is a tedious, silly, overbudgeted, overwritten popcorn flick. Riddick (Vin Diesel) is on the run. His current tail is a bounty hunter named Toombs, played by Nick Chinlund. Chinlund’s grizzled look suggests that he was second choice to Tom Waits, and his roguish charm makes Toombs the best character in the film. Toombs flies a small, dirty ship whose gunners dangle from the wingtips by straps. Riddick tracks down Imam (Keith David, reprising his role from Pitch Black), who hired Toombs. Imam’s planet is being conquered by the Necromongers, and he thought Riddick could be bribed into helping fight against them. The Necromongers are not a race, but a society. They demand conversion to their religion or death. They’re a bit like the Star Trek Borg, but with a little more free will. 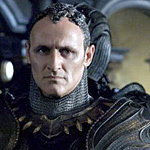 Their Lord Marshal (Colm Feore) is an effeminate weirdo with a metallic wig. Writer/director David Twohy’s screenplay recycles the ol’ story of Moses (and Star Wars): a prophecy foretold of a Furyan child becoming the Lord Marshal’s undoing, so he had all male Furyan children killed. Of course, Riddick somehow slipped through the cracks. Before the foretold denouement, Riddick is recaptured by Toombs and taken to a prison planet where the inmates stay underground because of the intense, blistering sunlight. There he finds Jack, the third survivor of Pitch Black, who now calls herself Kyra. Riddick’s escape plan is postponed by a fight between Toombs and the jailers and the untimely arrival of the Necromongers. These scenes are the best because they’re the furthest removed from the bad political drama of the rest of the film. Like Pitch Black, they allow a tense race against the elements, our heroes outrunning the planetary terminator and the deadly dawn. But too soon Riddick is back among the Necromongers who have captured Kyra. Lord Marshal is as stupid as any movie supervillain, being drawn into a one-on-one fight with his prophesied killer instead of having him neatly and quietly killed. There’s also a trite rescue-the-girl scenario that’s hard to fathom, given that there was no chemistry between Riddick and Kyra in two movies. You’d also think that supervillainy would be enough reason to inspire assassination. Or even just run-of-the-mill kidnapping. I guess a supervillain kidnapper who takes “your” girl is a slightly more worthy foe. There is a naive religious undertone to the plot that fails to say anything interesting about the nature of faith. The villains are religious fanatics willing to kill infidels and heretics. But the movie doesn’t condemn religion or fanaticism. Imam refuses to convert, saying essentially “my religion is right and yours is wrong.” The movie glibly asserts the existence of souls — Lord Marshal has the power to rip them from their bodies. Only Dame Judi Dench, who recalls Sir Alec Guinness’ Obi-Wan Kenobi with her flowing robes and prophetic wisdom, plays a nonbeliever, saying of her kind “we ... calculate.” The movie fails to say whether she’s susceptible to Lord Marshal’s soul-grab or not. If the characters have souls, they don’t have much character. Riddick was a chained animal in Pitch Black, but in his own movie he’s just another catch-phrase spouting action hero. Thandie Newton’s character’s two personality traits are a skintight leather outfit and a lust for power that matches Lady Macbeth’s. It’s possible none of these complaints would matter if the action scenes were interesting enough. But they’re not. Riddick’s weapon of choice is a blade, so there are quite a few fight scenes, and they are almost all bad. There is a hint of choreography in the fights, but Twohy’s main technique is to cut them to shreds and splice them back together in no particular order. He even acknowledges the technique in a joke: after a few seconds of chaos he cuts to two dumbstruck onlookers who aren’t quite sure what they just saw. Maybe the fantastic “sci-fi” elements will entertain summer crowds. Gigantic spaceships with four-headed gargoyles rumble through space. The ships have gratuitously rotating machinery that clangs to a stop when they land. But unless you’re 13 and this is your first action movie, these stylistic touches just seem silly. I used to think that Pitch Black was a great movie in spite of a relatively small budget. The Chronicles of Riddick proves that it was a great movie because of its relatively small budget. In Twohy’s universe, bigger is not better. Twohy has threatened to make two sequels, but they would necessarily continue the political story, which is the weakest link in The Chronicles of Riddick. I’m no longer looking forward to any more Pitch Black movies.